Located about 1.5 miles from Orient Point, the tip of Long Island’s North Fork, lies this 840 acre island. Well-known from Nelson DeMille’s book of the same title and even more so because of the Plum Island Animal Disease Center ("PIADC") that exists there, this wildlife rich Island is a vital stopover site and breeding ground for migratory birds, seals and other species. Unfortunately, its ecological resources are in danger of being lost. In 2008, Congress approved sale of the island to a private party, with plans to move the National Bio and Agro-Defense Facility to another state. The approximately 85% of Plum Island that is undeveloped holds significant ecological and scenic sites. In addition to playing host to over 200 bird species, the Island also holds nationally-significant artifacts and historic buildings – including the 1870 Plum Gut Lighthouse and the 1897 Fort Terry army barracks and weapons batteries. Plum Island’s scenic value, ecological resources and historic sites offer tremendous potential for recreation and public education, and make it an ideal candidate for permanent preservation. In 2010, HOBAS, along with two others, founded the Preserve Plum Island Coalition. Today, this Coalition consists of over 60 organizations and is fighting to preserve the Island from developers. The mission of the Preserve Plum Island Coalition (PPIC) is to secure the permanent protection of the significant natural and cultural resources of Plum Island. The PPIC advocates for comprehensive solutions that safeguard this national treasure; this includes dedicating Plum Island's undeveloped acreage, approximately 80% of the island, as a National Wildlife Refuge, or creating a preserve providing equivalent protection in perpetuity. The PPIC recognizes the existence of the Plum Island Animal Disease Center (PIADC) and the jobs supported by this facility. If the Center is closed, and no adaptive reuse occurs, the PPIC supports the removal of non-historic buildings and surplus infrastructure, the clean-up and restoration of any impacted resources and the dedication of the PIADC property as conservation lands. 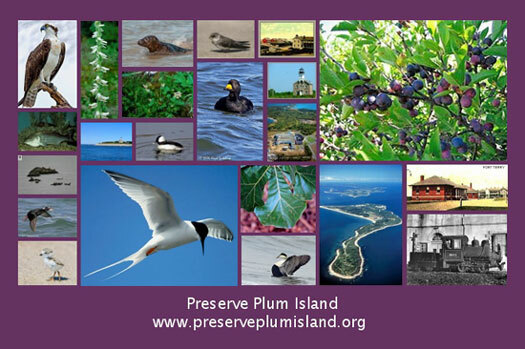 For more about Plum Island and our efforts, please visit the Preserve Plum Island website or the Saving Plum Island website which contains an informative video.